Join the Rich Coast Project and students from Indiana University's Media School for an evening of story sharing. Members of the RCP team will guide a series of facilitated story exchanges based on the method developed by Narrative 4, a nonprofit dedicated to "building a community of empathic global citizens who improve the world through the exchange of personal narratives." 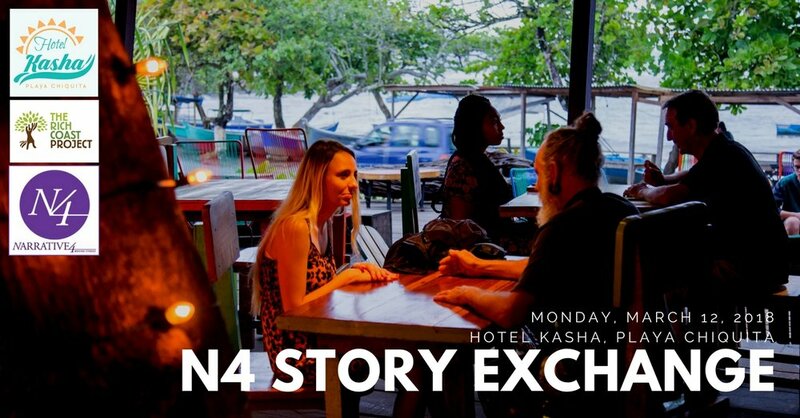 The core methodology of N4 centers around a story exchange, which pairs participants and asks each participant to their partner’s story in the first-person. The story exchange works on a simple idea: If I can hear your story deeply enough to retell it in my own words, as if it happened to me – and you can do the same for my story – then we will have seen the world through each other’s eyes. We are looking for at least 12 local participants. If you are interested in sharing your story and witnessing the transformational power of active listening, please PM us or send us an email at therichcoastproject@gmail.com. We will follow up with more details. You should be available on Monday, March 12 from 5-7 pm and able to converse in English. Light refreshments will be served.